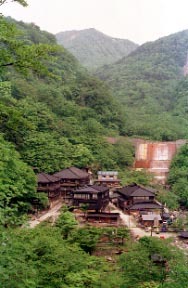 The hot spring of the isolated lodging house with abundant hot water quantity which gushes automatically to the ravine of complementary Sasagawa at the foot of Mt. Asahi. 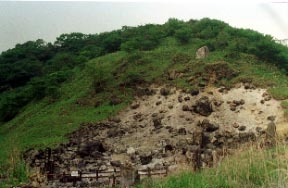 Since small animals died from poisonous gas a long time ago when the "cruel (steep hill, being easy to slide cautions) stone" hit whole surface sulfurous smell which can be viewed if it goes into the right hand near the "piece KA waterfall" joint parking lot hangs over, it is said that this name stuck. 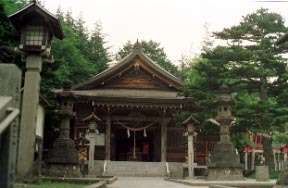 Yoichi of "Nasu Onsen Shrine" Nasu prayed for the fortune of war. 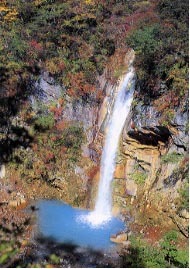 one of the Japanese one hundred famous mountains "Mt. 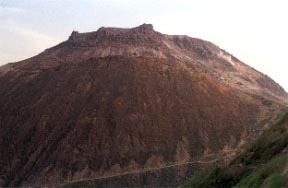 Nasu" -- still -- 1917 m of volcanic-fumes emit Mt. Chausu.